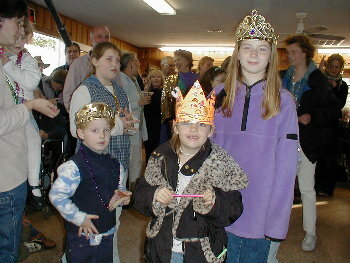 March 1, 2001 Although Spring is technically three weeks away, daffodils are already pushing their heads up out of the ground, cherry trees are blossoming, and the Spring herring runs are underway in the Albemarle Sound. The Cherokee crew are as busy as carpenter bees, preparing the vessel for her future debut. Tom and Leonard have rigged up a Spanish Windlass to hold the shape of the vessel sides while they glue in the transom structure. Leonard and Tom are building the massive framework for the transom. 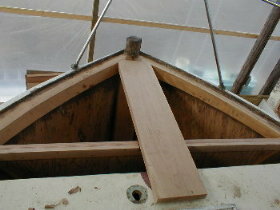 The old wood on the sides has been cut back to allow new wood to be scarfed in. Have we mentioned that the overall boat length will be 64 feet and seven inches with the newly extended transom, an addition of five inches? 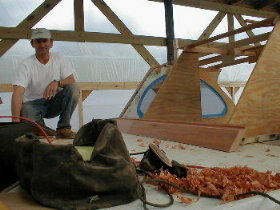 Above deck, Jeff Heyland continues his work on the pilot house windshield. Nearby, John Stein has completed the king plank, which is a structural member on which the anchor winch and forward cleats bolt. John has made progress on the bulkhead of the anchor locker. He’s cut the vent holes and glued the locker frames to receive the separately constructed bulkhead. Meanwhile Robbin is patching the bulkhead between the tankroom and equipment room. She has also installed the sistering frames in the forward equipment room. Jeanette is chemically stripping the bulkhead next to the engine room. The boat keelson had to be cut and removed to allow the installation of the bow thruster. 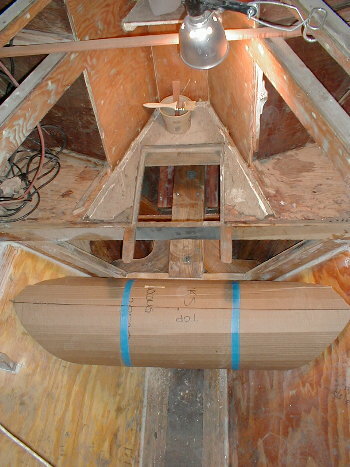 In order to transmit the load of the keelson through the area of the bow thruster, Bill Brown laminated three layers of plywood to the hull – the knees (the curvy pieces visible in the photo below just above the blue tape lines) transmit the load to the frames and this additional planking. 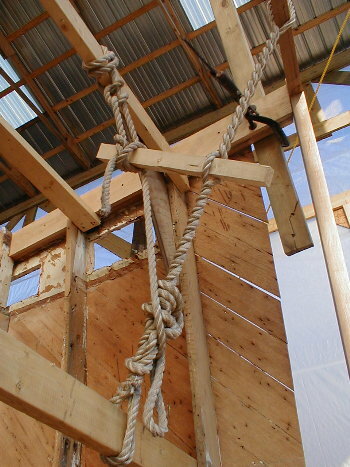 A similar arrangement of knees connects the rear end of the cut keelson to the same planking area. These extra layers of plywood planking also allow for the relief cut behind the bow thruster tube on the outside of the boat, which will cut down on turbulance created by water passing over the tube area.